“Michael Jackson: The Immortal World Tour" visits Penn State on Tuesday. Photo provided by Cirque Du Soleil. This show is the largest production ever at the Bryce Jordan Center, and will combine the traditional Cirque du Soleil acrobatics and gymnastics with live music to create an experience unlike any other show yet. Onward State's Alex Robinson had the chance to sit down with Maxime Charbonneau, the main publicist for the tour, to ask him more about the show. Onward State: What is Michael Jackson: The Immortal World Tour? Maxime Charbonneau: We’ve had many Cirque du Soleil shows stop by State College, but this show is like nothing you’ve seen from us before. It’s a completely different experience. This show is more like a pop-rock concert, to which we added our Cirque du Soleil elements. You have about 60 artists on stage, mixing acrobatics and effects with live music. The show is a tribute to Michael Jackson, to his music, and to his legacy, and it’s a fantastic show. It’s a great experience. If you’re a Michael Jackson fan, you’ll love the production, and if you’re a Cirque du Soleil fan, you’ll love the production. It’s a completely different side of Cirque du Soleil and that’s what makes it special. OS: What does a typical day include for the performers? Is there alot of training on tour? MC: It’s a little different for this show compared to others, because we play up to three nights in every city that we go to, and we’re playing 4 or 5 shows per week. We’re always traveling, and it’s a very big production. We have about 35 trucks to travel with, so we need an entire day to set up. Many times, we’ll rent a local space in advance, so they can go to a local gym to do a workout as well, and then perform at night. They work out in the mornings, and then get to the arena at around 4 pm for the show later that night, and right after the show we pack up and get out of there. We’re always on the move. OS: What personal connections are there to Michael Jackson included in the show? MC: We have five members of the band that have either toured with Michael or recorded with him. In fact, the drummer Jonathan “Sugarfoot” Moffitt played with Michael and the Jackson family for over 30 years, and Greg Phillinganes, the musical director of the show, played with Michael for over 25 years. There are also three other members of the band that played with Michael. They played with him, but were also part of the creative team for the show. For this production, we had many people that either performed with him or closely worked with him in the past. Even the creator of the show, Jamie King, danced with Michael in 1992-1993. OS: How would you respond to people that would say that this wasn’t a Cirque du Soleil show, as much as just using the name “Michael Jackson” to sell tickets? MC: To be very honest with you, it’s not a traditional Cirque du Soleil performance, and we know that. If you’re a traditional Cirque du Soleil and you want to see just straight acrobatics for two hours, that’s not what this show is about. It’s a unique blend between a Michael Jackson concert and a Cirque du Soleil show. There’s great choreography and a lot of dancing. We have 30 professional dancers as part of the show, and they are the best at what they do, and they do all the iconic Michael Jackson choreography. However, there’s also some unique acrobatic moments, some aerial moments and tumbling. It’s not a traditional Cirque du Soleil show, don’t expect to see Alegría or another show that you might have seen in State College before, but it’s an incredible show with the feel of a pop-rock concert. 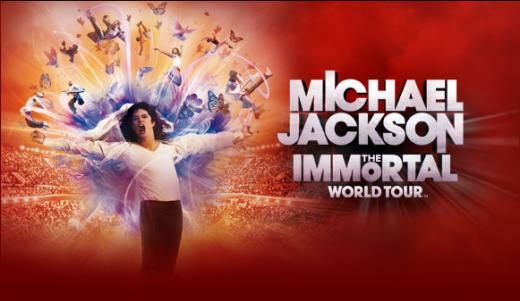 OS: Tell us something that we wouldn’t know by just reading the title “Michael Jackson Immortal World Tour”. Is there anything quirky or interesting you want us to know? MC: Most people would think that we would play just recorded Michael Jackson songs, but that isn’t the case. We extracted only Michael Jackson’s voice from his original master recordings found in his estate. We use just his pure voice, just as he would have wanted it in his concert, as the foundation for the music. To that we added our live band, including a horn section for the first time. It’s quite unique, and you get to hear Michael in a different way then you would have for years and years with his original songs. OS: How long is the tour lasting, and how many different cities will you be in? MC: We started in October in Montreal, and we’ve been to about 40 cities so far. We’re scheduled to play about 65 cities in North America, up until about August, and then we’ll be in Europe for about another six months. There will be more shows added though, we’ll be on the road for about another two-and-a-half years. There will be only one night in State College though, on April 24. Check out what promises to be one of the best shows of the year at the BJC on Tuesday. Tickets can be purchased at Ticketmaster.com.